SBI MAGNUM TAXGAIN tax-saving fund has lagged behind its peers across different time periods. Much of this stems from its preferred large-cap tilt compared to peers, who have benefited from a higher mid-cap exposure. Its portfolio average market capitalisation is lower than its category average by `20,000 crore. The fund has recently been handed over to a new fund manager who maintains a strict value bias and insists on higher margin of safety in his stock picks. Besides, the portfolio takes healthy exposure in its top bets as the fund manager prefers compa nies that provide cushion against a downside. SBI MAGNUM TAXGAIN approach may lead to sharp bouts of underperformance, but may reward conservative investors in the long term. Currently, passive investing is not popular in India, as most actively managed funds have beaten their respective benchmarks. However, as the market matures, it may be difficult for fund managers to generate alpha. Just as actively managed funds can be segregated into different types, passively managed funds are of two types: index funds and ETFs. Though both of them replicate the underlying index, there are some basic differences between both of them. We spoke to few experts to find out which one is more suitable for retail investors. Liquidity: Units of index funds are priced at the end of the day after business hours just like a mutual fund. However, in case of ETF, the price of the ETF units keep on fluctuating depending on the number of transactions. Suresh Sadagopan of Ladder7 Financial Advisories recommends index funds to retail clients as investors do not have to worry about finding a buyer or contacting the fund house when they need to sell their units. He says that investors should be careful while choosing an ETF as liquidity may be an issue with a few fund houses. Another factor that makes index funds more suitable for retail clients is the impact cost associated with ETFs. If the trading is less in an ETF, the bid-ask spread widens which raises the impact cost for both buyers and sellers. On the other hand, there is no impact cost for index funds. Impact cost is the cost that a buyer or seller of ETFs incurs while executing a transaction. For instance, if investors sell 300 units of ETFs, the first 100 units will be sold at the market price compared to other 200 units, which will keep on decreasing due to demand constraint. Expense ratio: ETFs have a lower expense than index funds. In most cases, the expense ratio of an index fund is 10-20 bps higher than the ETF. In fact, the expense ratio of a few index funds exceeds 1%. In addition, AMFI data shows that there are 54 ETFs as on September 2017 compared to 20 index funds. Portfolio allocation: Index funds have higher exposure to money market instruments compared to ETFs. It is because an index fund can’t be traded like an ETF. This leads to the difference in returns due to tracking error. Let us look at it with the help of an example. As on September 2017, SBI ETF Nifty 50 has 99.9% allocation in equities whereas SBI Nifty Index Fund has 94.65% in equities, shows Value Research. Though both these fund track the same index, SBI ETF Nifty 50 has delivered 19.79% while the index fund has given a return of 18.76% over the last one year. Demat account: As ETFs are similar to stocks, investors need a demat account to buy ETFs. Index fund is better for retail investors, as they do not have to open a demat. Mutual fund advisors complain that new Equity Linked Saving Schemes (ELSS) investors are getting into these tax planning mutual find schemes without doing any homework. According to them, many new investors are flocking to ELSSs these days. However, they have no idea about the product or how they can use it to meet their financial goals. ELSSs have a mandatory lock-in period of three years, which is the lowest among all the products under section 80C. However, an investor need not necessarily sell his investments after the mandatory lock-in period. If the scheme is performing well- that is, beating its benchmark and category average- the investor can hold on to his investment to meet a long-term financial goal. This has been our concern with many investors who invest just to save taxes. Basically, these investors do not have a goal other than saving tax for that particular year. So, they have a tendency to move out as soon as the lock-in gets over. Equity investments are meant for long-term. Many of these investors do not even understand that ELSS is essentially an equity scheme. You need to be invested for more than five years or it is risk .. Managed by Neelesh Surana, the Mirae Emerging Bluechip fund is amongst the best and most steady performers in the mid cap space. The fund is positioned true to its small and mid-cap orientation by maintaining around 75% of its portfolio. The strategy is centered around bottom-up stock-picking with exhaustive filtration laying great emphasis on margin of safety. Surana believes alpha is generated through the right stock selection and not by sector rotation. He only invests in companies that meet the stock selection parameters and would look at both qualitative and quantitative factors. A key quantitative parameter he tends to follow is high return on capital and high cash flows. We believe the fund can hold investors in good stead over a market cycle. The fund currently accepts fresh investments only through the SIP mode. Process: Ravuri typically looks for growth-oriented quality stocks that are reasonably priced. Performance: Under Ravuri, the fund has built a strong track record on the risk/return front. The fund remains a strong choice for investors. Manager Srinivas Rao Ravuri continues to do what we have come to expect of him–look for quality names with sustainable advantages using a research-intensive approach, which comes naturally to him as a result of solid experience as a research analyst spanning more than 11 years before taking charge of this fund in April 2006. Ravuri combines top-down and bottom-up approaches, with the latter being significantly more important. He looks for companies with strong business models and sustainable advantages. A long-held investment in Solar Industries typifies the approach. Ravuri bet on the explosive manufacturer’s technological and sales prowess coupled with the high barriers to entry into the business and has been rewarded over the long haul. The process has its caveats, though. Ravuri is valuation-conscious, which with an inherent long-term orientation means he will take short-term pain for long-term gain. For instance, he kept his faith in State Bank of India in 2013 even though its fluctuating fortunes (following a rise in nonperforming assets and poor results) hurt the fund’s performance. Further, in a downturn, his policy of staying fully invested may lead to underperformance versus peers that get their cash calls right. Apart from avoiding areas of the market he considers expensive, the manager will also back his best ideas with conviction. The strategy can result in investments that go against the norm over shorter periods. For instance, investing in certain out-of-favour public sector names, while steering clear of select technology and healthcare companies that Ravuri deemed expensive, contributed to the fund’s poor showing in 2013. However, we believe the approach can hold the fund in good stead over the long haul. Indeed, on the manager’s watch (April 2006 to December 2016), the fund has delivered a strong showing, besting both the S&P BSE Sensex Index and the category average. Our conviction in the fund’s long-term potential remains unchanged. traditionally people’s idea about gifting is about buying someone a physical good, which could be flowers, chocolate, cloths, diamond, jewellry, car or some other thing. Cash gifts are also popular among people. A new trend, however, is slowly emerging: Gifting a financial product. Such a gift could be a mutual fund SIP, a fixed deposit or an insurance plan. And interestingly in this segment, it’s the grandparents who are taking the lead. Franklin India Balanced Fund scheme seeks to achieve long-term capital appreciation with stability of investment and current income from a balanced portfolio of high quality equity and fixed-income securities. Franklin India Balanced Fund, which has never dipped below three stars in the last 12 years, this fund is the ideal fit for conservative investors. It takes very few risks both on its equity- or debt-market investments. Franklin India Balanced Fund mandate allows an asset allocation of 50-75 per cent in equities. But in practice, the fund has maintained about a 68-32 allocation between equity and debt on a steady-state basis. The equity style followed is growth at a reasonable price. The fund manager also uses a macro overlay to align the sectoral exposure in line with the economic growth outlook. On debt Investment, the focus is to generate regular coupon income, along with some capital appreciation through active duration management. The debt portfolio is usually invested in corporate-debt instruments. With its stated focus on low-volatility returns, this fund has navigated bear markets as well as bull phases. Though traditionally a sedate performer in bull markets, in the last three and five years, the fund has beaten its benchmark by 5-6 percentage points. The outperformance relative to the category is more modest, at 1-2 percentage points. In recent times, the fund has been overweight on large-cap stocks relative to the category, with an allocation of over 85 per cent within the equity portion. It has been underweight on mid- and small-cap stocks. This should shield returns from volatility should markets decline. On the debt side, the latest portfolio featured AA exposure of about 8 per cent, with the bulk of the allocation in sovereign and AAA bonds. A good option for investors who would like to limit downside. Inflows in income funds went up by 44% in calendar year 2016 as compared to the previous year; and in 2017 inflows are already 8% higher than in 2016. Thanks to the downward rate cycle in domestic economy, income funds have seen more investors and inflows. In 2015 and 2016, many income and dynamic bond funds increased their duration to take advantage of the falling rates and fared well, delivering double-digit returns. Duration measures the change in price of a bond as interest rates change. Bond prices rise with fall in rates. However, the pace of rate cuts has since slowed and duration-led returns are now harder to come by. The last 1-year average return for dynamic bond funds category is at 5.85% and for income funds category it is 6.85%. 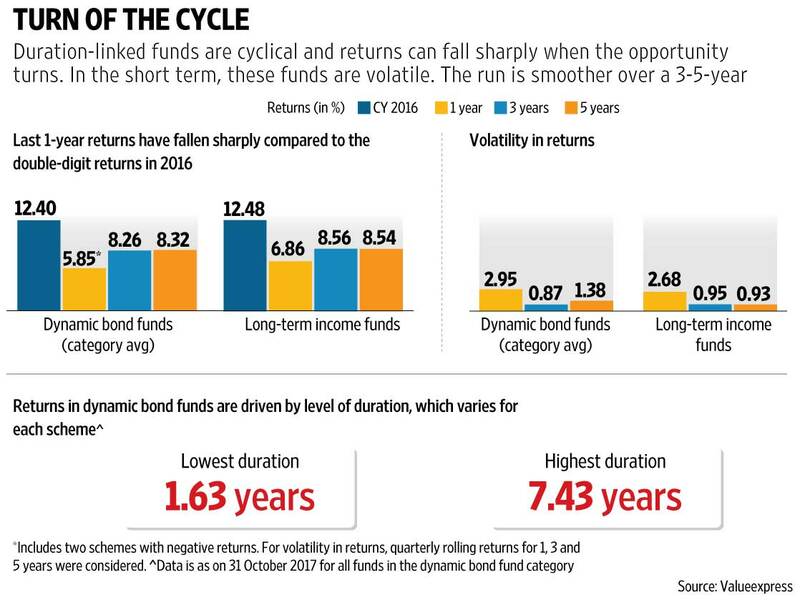 Just like equity schemes, these funds too are more volatile in the short term and tend to give relatively stable range in returns when you consider a 3- to 5-year period. Where did the return go? The moderation in returns is led by fewer rate cuts last year and an expectation that the rate-cut cycle itself is near an end. Experts talk about one more cut at the most, which is priced in by the market already. The 10-year government security (g-sec) yield moved from 6.2% in November last year to 7% now, leading the bond market correction. External risk factors, concerns on fiscal deficit and inflation have also impacted bond markets negatively in recent months. Globally, interest rates are moving up and we don’t see domestic rates moving in the opposite direction for too long. Moreover, over the last year we are seeing the return of commodity super cycle and crude prices on an upward trajectory. This impacts the domestic import bill significantly. With the recent bank recapitalisation announcement, there are fresh worries about fiscal slippages. This, consequently, leads to worries on inflation and currency. Many experts believe that for now the rate cycle has turned negative and risk-reward in high g-sec oriented funds is not favourable. A lot of the expected risk on the fiscal front may already be priced in. Yields may not fall sustainably from here. However, it is not looking very bearish either (risk of rising yields). Inflation may rise as a result of commodity prices moving up, but we don’t expect a significant shift. There is no clear directional shift to look forward to in yields, it’s going to be more about tactical shifts in the near term. Looking deeper into individual fund performances shows there are outliers that have delivered 8-10% return even in the last year. Where did they manage the higher returns from? These are funds where first, the duration in the portfolio is lower than the category average; and second, there is a higher proportion of the portfolio that relies on accrual or interest income from corporate bonds and debentures. Income funds are inherently volatile in nature owing to their exposure to duration through government securities. On the other hand, dynamic bond funds—if the fund manager chooses to—can move out of these securities meaningfully to curtail losses in a negative rate cycle. Currently, the range of duration in dynamic bond funds is quite wide (see graph). Funds that are still keeping long-dated g-secs and maintaining a high duration, are delivering a lower return. Those that have shifted strategy and focus on yield from bonds rather than opportunity in the rate cycles, are the ones performing better in the past year or so. The question remains, how should you approach your recent investments in these funds? Both these types of funds are opportunistic in nature and maximise returns in the brief periods when interest rates fall. If you can time the entry and exit into these schemes with the rate cycle, you will be able to benefit from the potential double-digit returns and exit before the trend changes. However, for retail investors managing such precise timing is not a viable option. In dynamic bond funds, fund managers keep readjusting their strategy based on the market, which results in smoother returns in 3-5 years. Average 3-5 year returns for the category, seen over the last 20 quarters, show a consistent range of 8-9% annualised return from both these categories. Dynamic bond funds give managers the flexibility to move across the spectrum of securities, depending on where the opportunity is. The call isn’t always accurate but the flexibility to shift means one needn’t stay where the opportunity has ended. Remaining invested for 3-5 years also means moderating your return expectation lower from the double-digit returns seen in previous years. Long-term income funds are riskier as they tend to maintain duration regardless of the market, owning to the fund investment objective. For short-term parking of money, both the categories are inappropriate thanks to the inherent volatility; and for those looking at medium- to long-term allocation, it should be at least 3 years for tax efficiency and smoother returns. Asset markets move in cycles. The bond market in India saw a rally last year. Does this mean we are heading for a prolonged correction? It’s hard to predict that. However, there is some negative impact thanks to factors such as sharply higher crude oil prices, and fiscal risks arising from government’s bank recapitalisation plan. We turned negative on the duration cycle about 4 months ago. It is a relative strategy. We revisited whether g-secs presented a better opportunity or corporate bond-led portfolios, and found the latter to have a better risk-reward premium. This does not mean investing in credit funds where spreads have compressed. We prefer bond funds with higher-rated corporate bonds and limited g-sec exposure. Think carefully before adding exposure to income and dynamic bond funds in the current market. Your choice may take longer than what you saw in the last year or two to reach the expected return. For investors who have a more long-term approach to investments, staying with their overall strategic asset allocation is more important. Given the current trend in interest rates, we aren’t advising a very high allocation to dynamic bond funds; within the fixed income allocation, a 20%-25% in these funds is suitable. A bullish phase may have warranted higher allocation. It is important for investors to remain diversified across assets and stick to the overall asset allocation with tactical changes. For those looking to capatilize on opportunity presented by the rate cycle, it seems to have played out for now, with more risks in the near term than benefits. The SEBI circular on categorization and rationalization of mutual fund schemes is set to change the way the Indian mutual fund industry offers their products. It will do away with duplication of fund mandates and lack of clarity in fund objectives. It is not a sea change as it is more of a rationalization, but the parameters have been defined and there are going to be changes in the way funds are managed. Let us look at the new contours of debt fund management. There will be 16 categories of funds and an AMC may have only one fund in each category. Here the duration refers to ‘Macaulay Duration’. Macaulay Duration is somewhat similar to Modified Duration. While Macaulay Duration calculates the weighted average time of maturity before the cash flows on bond starts, modified duration measures the price sensitivity of a bond due to change in the yield to maturity. Typically, Macaulay Duration is marginally higher than Modified Duration. The duration of the fund has to be more than 7 years. That means, even if fund manager expects rates to move up, he cannot bring down portfolio maturity to make the fund defensive. Hence, it will be a true long duration fund across market cycles. Investors with high risk appetite and long term horizon can invest in such a fund. There is no limitation in terms of portfolio maturity or duration. It will invest across duration. The fund manager can increase or decrease the portfolio maturity based on his views on market movement. The strategy of this category of funds remains unchanged. Gilt fund: This category has been defined in terms of composition only; minimum 80% has to be in gilts. Maturity can be across i.e. the fund manager can play either short or long on the yield curve, depending on his views. The duration is defined as 4 to 7 years. So far, this category did not exist in the real sense, only a handful of AMCs have a product that adheres strictly to this definition. Now that it is defined, investors will have a choice in this duration bracket. With a duration of 3 to 4 years, it will be a proper medium duration category. Short duration fund: Currently, the average maturity in short duration funds ranges between 2 and 4 years. Now the definition is 1 to 3 years i.e. in terms of duration, not maturity. There will not be any short maturity gilt fund but one fund across maturities. This category has been defined, not in terms of portfolio duration, but portfolio composition. Minimum 80% has to be invested in top rated corporate bonds. Currently, the term is used as a synonym of credit-based funds, which has now been done away with. The portfolio duration is expected to be similar to short duration funds. Interestingly, the term risk has been used and SEBI has stated that terms like Credit Opportunities Fund, High Yield Fund, Credit Advantage and so on cannot be used. Minimum 65% has to be invested in lower rated (below highest rated) instruments. The strategy remains same but the terminology has changed. Portfolio maturity is likely to be manage like a short duration fund. Investors will have more clarity e.g. what is the duration range of a short duration fund or long duration fund or what is the credit quality of a corporate bond fund. The terminology of credit risk funds will be more appropriate now. The advisor can now recommend funds with a higher degree of conviction as the AMC cannot tweak fund strategy, they have to remain true to label throughout. Simply put, life becomes easier for distributors with better clarity. This open-ended equity linked savings scheme will make your money work on the double. This fund not only offers to grow your capital with a target allocation of 80% equity, 20% debt and money market securities, but also helps you to save tax.